If you haven’t yet, check out Part 1 of this series here. There’s a commercial that comes on the radio around every Valentine’s Day where I live. It’s the same year after year. There’s a voice-over guy that tells us that ‘if your wife or sweetie says that you don’t have to get them anything for Valentine’s Day because they knows that you love them, then it’s time to go to this jewelry store.’ And then they tell you how much that a diamond for year sweetheart is going to make them love you even more and such and such, junk and junk, lies and lies. The sales pitch here is that this jewelry store knows your wife better than you do. Not only do they know your wife better than you do, they know how she feels better than you do. They know her specific love language and know how to cater to her, how to make her feel loved – all better than you do. This is the same trick that the devil plays on Christians around the world. According to him, he knows how to be a Christian better than you do. He knows how to serve the Lord better than you do. He says this right in your mind as a thought and he says this through other people, all in the hopes that you’ll actually listen to him and do what he says – just like this jewelry store. But if you for one second actually think that the devil knows God better than you and how to serve Him better than you, you’ve already started falling for his lies. By the way, the jewelry store does not know your wife better than you. This is the same lie that Satan told in the beginning. Satan convinced Eve with lies of “Did God really say that? You could be better if you listen to me, not to God.” Satan has no new tricks. It’s the same ones he’s used over and over, just tailored to fit your situation. Don’t fall for his trap. If you look in the New Testament, you find this same thing. The whole book of Galatians was written because people came in and told the church that they had to live a certain way so they could be a Christian. The Christians at Galatia listened because these people seemed like they knew what they were talking about. The issue was that the church in Galatia was filled with baby, immature Christians. They didn’t know the Word. People came in and said that salvation was by “the works of the law” – to be a Christian, you had to keep the law. The Christians there were allowing someone outside the church to tell them how to live. Paul tells the Galatians that this same issue that was happening there had also gotten to one of the top leaders of Christianity – the Apostle Peter. Peter was allowing someone other than the Word of God (in Peter’s case the Bible was the vision the Lord gave him), to tell him how to live his Christian life. And people that were telling him how to live were Christians themself. They were just Christians that hadn’t gotten the revelational truth of God’s will. There’s a lot of Christians that allow other Christians (many times their own leaders) to tell them how to live because those people have not gotten the revelation of God’s will on a subject. It’s not that they’re necessarily bad, but they are wrong. We follow what the Bible says. Yes, we follow what our church leaders tell us, as long as it agrees with the Bible. The Apostle Paul said, “Imitate me, just as I also imitate Christ (1 Corinthians 11:1).” Sometimes it’s a lot easier to follow a human being because we can see them, and we’re at the level in our faith that we need to see a flesh and blood person be our example. But we only follow them to the degree that they follow Christ. If they ever stray from what the Word says, you stop following them – period. It doesn’t matter if they’re a nice person. It doesn’t matter if you’ve followed them for years and years. It doesn’t matter if they’re your best friend or your relationship is tighter than any other human on the planet. You don’t follow them if they’re not following Christ. Look back to Genesis with me. Eve had an issue to begin with that allowed the devil to lead her astray. What did she tell the devil that God said to her? Eve says that God told them about the tree of good and evil: “You shall not eat it, nor shall you touch it, lest you die.” That’s not what He said though. The Lord said not to eat from it or you would die. Eve added that little part about touching it. Eve didn’t even know what the Lord had said correctly. How was she going to live it? If we don’t know what the Word of God says, how are we going to live it? How are we going to know when someone comes along and tells us a lie about it? We won’t. That’s why it’s so important to know what the Bible says. We’re approved by God when we’re obedient to Him and His Word. We can’t be obedient to Him if we don’t know what to be obedient to. We must know the Word of God. We must know what the Bible says. Don’t listen to the man on the radio telling you that he knows your wife better than you. If you just look at the surface of what the Word says here, and don’t dig any deeper, it appears that Eve could only know what God said because Adam had told her. It says that God told Adam, not Eve (there’s a whole lot more to it than that though). But for us today, how much of the Word have we heard because someone told us, rather than we’ve read it ourselves, we’ve studied it out ourselves? Oh yes, it might be put up on a big screen, on a power point, but did you read it yourself – in context? Or did you allow someone else to tell you the Word, hoping that their interpretation and their paraphrasing is correct? You can’t do that. You have to know the Word yourself. Church should not be the main course of your life. We should be reading, studying, getting to know the Word and our Lord every day. Church day should just be the day we do it with other people and someone that has a message for us, based on the Word that we should already know. The devil is trying to tell us how to be a Christian. He doesn’t know how to do it himself. Why are we allowing him to tell us how to do something he doesn’t know anything about? Don’t let the salesman who knows nothing about you, your life, your needs, try to sell you snake oil that doesn’t work, you don’t need, and will end in your destruction. Don’t do it. 1 Timothy 4:1 says, “Now the Spirit expressly says that in latter times some will depart from the faith, giving heed to deceiving spirits and doctrines of demons….” We have to understand that this scripture is talking about Christians. Some people have been told for years that this is just talking about people that were in the church, but they were never really Christians. No. It’s talking about Christians. It says, “some shall depart the faith…” If I leave my house, I have to first go to my house. You can’t leave the store until you’re first at the store. You can’t depart the faith until you are first in the faith. It’s talking about Christians. The other thing about this scripture is the word depart. The Greek word for depart gives this idea of slowly turning. The turning is so slow and so unnoticeable that it will happen without the person even realizing it. So they start picking up this idea and that false doctrine and slowly start pulling away from the truth, slowly start listening to the devil how to be a Christian. Then one day, without them even knowing it, they have rejected Christ and are living for something else entirely. They may call it Christ, but it isn’t. The Apostle Paul told us that there is another Jesus, another Gospel, and another Spirit. It’s not another one; it’s just a distorted version of the truth. That’s what the devil does. Remember, Satan will use thoughts or he’ll use other people to get you off from following Christ, to live your life as a Christian, how he desires. We know the devil uses thoughts because that’s what he has always used. In the Garden, he spoke to Eve and gave here a thought, during the Lord’s temptation in the desert – he spoke to Him and gave Him thoughts. John 8 and Revelations 12 and 20 speak of the devil using his words – thoughts, against us. We have all had thoughts that were ungodly. They aren’t ours, just lies from the devil. But don’t take them. Don’t speak them, dwell on them, think on them – or you will act on them eventually. The devil uses people as well, even fellow Christians, to get us to follow Him, so that he can define to us what a Christian is and how we should live. 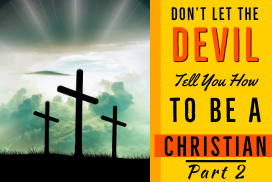 The devil even deceived the Apostle Peter into accepting the false idea of what a disciple of Jesus should be. If the apostle Peter could be deceived, so can we – if we don’t follow what the Word of God says. But also notice that the devil was using Peter to try and get Jesus to stop walking in the will of God. If the devil will do that to them, he will do it to us. He is no respecter of persons. There are so many Christians today, whether from the ignorance of the Word or the pressures of the world, are compromising what they believe and allowing the devil to tell them how to be a Christian. It happens on the stage of pop culture on TV shows and it happens in local schools and on the job. It happens through thoughts and peer pressure. Stand bold for the truth. Stay with the Word of God. It never changes, but it changes things. Dig in, dig deep. Find those promises in the Word that you can stand on in faith so that you can stand against the fiery darts of the devil. Put on the whole armor of God. Stay with the Word and with the Spirit.